Greetings from the top of Utah - I'm b-a-a-a-a-ack! 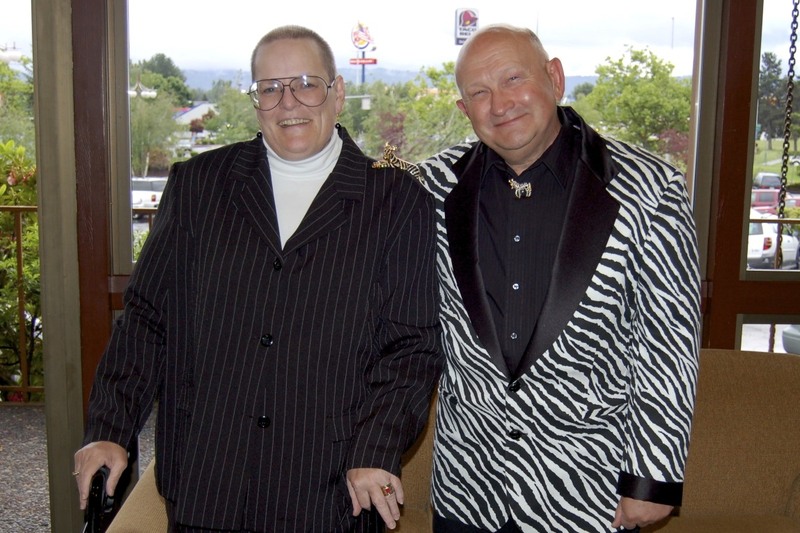 I've heard lots of interesting rumors about what happened to Kathie and I, but reality wasn't quite as interesting. 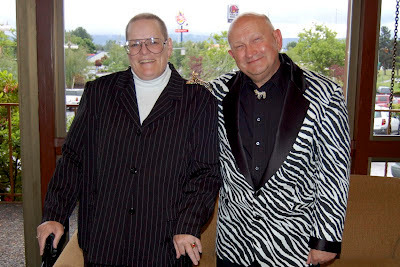 Neither of us died, were in a serious accident or were at death's door, but we both had health issues that brought abrupt changes to our quality of life. Physical recoveries and mental adjustments to the realities of our aging took time. Anyway, we plan on re-opening Zebra Gardens this year and even introducing our first two spurias. Nothing too exciting, but I believe one of them will offer something new in color combinations. 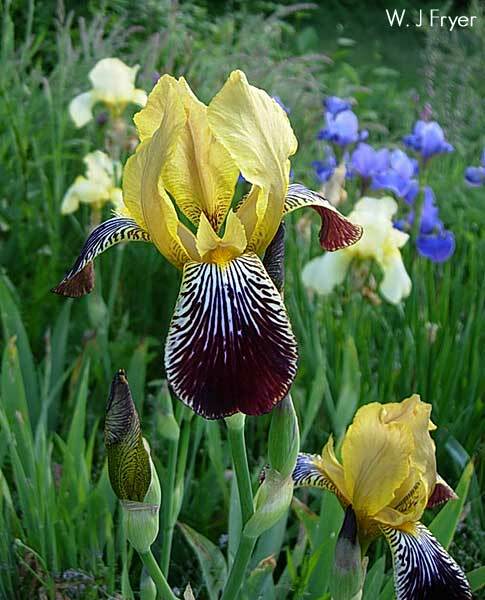 I've had to reevaluate and reduce my previous iris hybridizing goals to decide where my major interests now lie. The result was a decision to make spurias my primary focus for the future. Don't everyone groan at once! 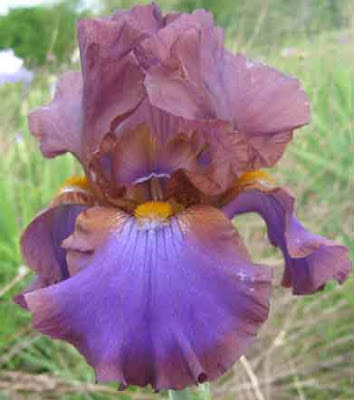 In the Winter 2011 issue Jim Hedgecock wisely encouraged spuria hybridizers to acquire a selection of spuria species irises and to incorporate them into their hybridizing programs. The hope for outcome would be an increase in colors and patterns within the hybridized spuria genotype. This is great advice and new hybridizers should make it one of their goals to do some of this hybridizing. However, it appears to me that the pattern diversity within the I. Spuria species is much more limited than in bearded irises. Thus we should also continue working to fully identify the recessive characteristics of the existing genotype (color, pattern, size, ruffles, frills, etc.). 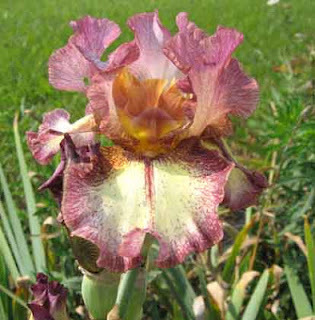 This is what happened and continues to happen in the hybridizing of bearded iris. Look at the variety there! Once again for at least the 1000th time I relearned the hard way that if I think I know what I'm doing - I probably don't. These delusions exist only because I wasn't smart enough to ask the right questions when I should have. 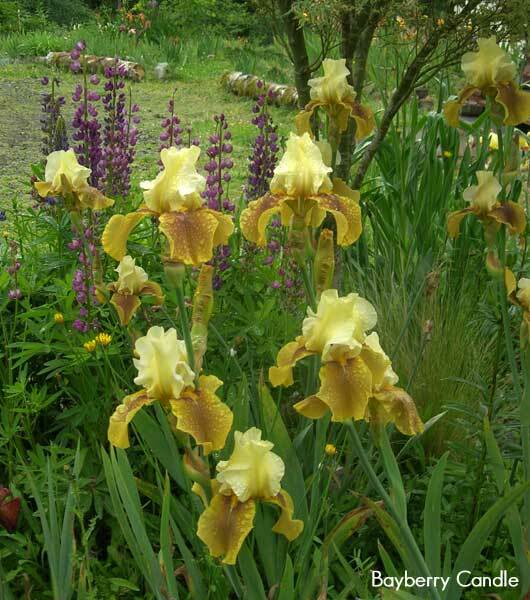 After my experience with hybridizing bearded irises I assumed hybridizing spurias would be similar -wrong! 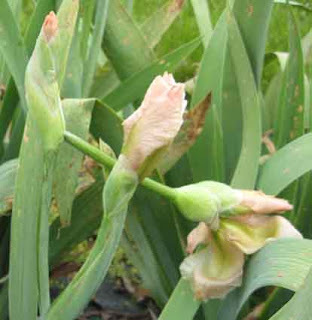 It seems that every technique or process I used with bearded irises was just far enough off the mark to impede my success with spurias in both producing seed and getting it to germinate. Seed germination has been the bane of my spuria hybridizing and I've tried everything I could think of to improve my results, but I always planted the seeds in POTS. Last year, Iris, the goddess of the rainbow must have smiled on my hybridizing efforts because we harvested almost 21,000 spuria seeds which was a huge increase over all other years. So I quickly created a convoluted plan to test several new methods of improving germination and producing seedlings large enough to transplant by mid-May. The crosses with the highest number of seeds were split into three groups: green seed to freeze, green seed to chill and dried seed to soak at the end of December. On the 2nd and 3rd of this January we potted these seeds up in 77 - 2 gal pots and stored them in my bedroom to await their later transfer to the greenhouse. I'll let you know the results in my next column. They should be good for a laugh at least. So with this work out of the way I finally decided it might be a good idea to check with Dave Niswonger to see if he could provide any help with my germination problems. Dave told me that the most important factor affecting spuria seed germination was how many soil particles were in direct contact with the seed. Thus he plants his in a seed bed made of loamy soil without any added peat moss or other organic material and gets around 75% germination. Incorporating organic material would reduce germination by reducing the seed to soil contact. Additionally, he said to NEVER POT the seeds up because potting mixes have very poor soil to seed contact! Now why didn't I ask him for this advice six years ago!!! Or even six months ago! As "they" say - the only stupid question is one not asked. My early years of hybridizing tales of woe will become an article at a later date after I have some confidence that I finally know how to hybridize spurias in northern Utah. One thing that I'm certain of is that geographical location, temperature zone, length of growing season and the amount, form and timing of precipitation makes an enormous difference in the culture of spurias whether gardening or hybridizing. It's my impression that this sort of information isn't adequately documented or mentioned in articles or on our website. Do you believe this information would be valuable if someone (ah! that elusive someone) would try to compile it? Please contact me at zebrairis@gmail.com if you think this is a worthwhile project. Have a wonderful bloom season! Editor's Note: It is with great honor and pleasure that with this article we bring you a new area of exploration to World of Irises - the Blog of The American Iris Society -- Guest Bloggers. Brad Kasperek is the first, and there's a reason for it. He is a hero of mine, for having had the courage to "boldly go" in pursuit of his fascination with Broken Color irises. I mean, the name of his business says it all, "Zebra Gardens - Irises of a Different Stripe." 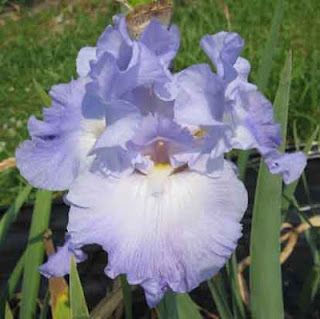 I can never forget how surprised I was to hear Jim Hedgecock say at one of his presentations that with only about 800-Spuria iris varieties registered, the field of spuria iris hybridizing is quite open, and the opportunities endless. So, I feel that Brad's work will bring new life to the world of Spurias. I'm very glad Brad explains about his and Kathie's health issues at the beginning of this article because as someone who followed their work closely, I was worried. So, Brad and Kathie, glad you're back on your feet and in the garden because the result will be, as we all know, beautiful irises. Welcome back! I hope we can get to hear more from Brad in the future. 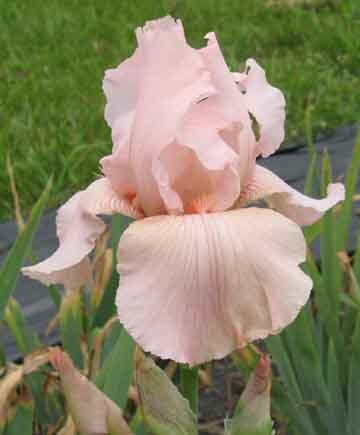 I will follow his steps into spuria iris hybridizing adventures with great interest. A similar version of this article first appeared in the Winter 2012 Edition of Spuria Iris News, the newsletter of the Spuria Iris Society. 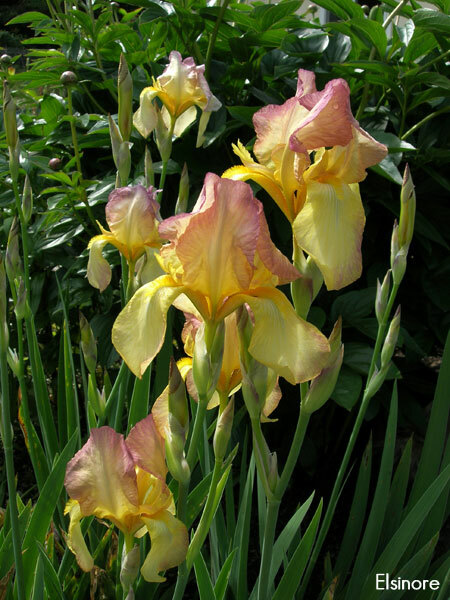 'Ibex Ibis' (Kasperek 2012), SPU, 45", M. Light medium lavender standards, stylearms and rim around fall with a bright yellow fall center darkening to gold at the arm crest, 5 to 6 buds. 'Ode to a Toad' (Kasperek 2012), SPU, 38", M. Rich, red-brown maroon standards and mottled purple & brown style arms. 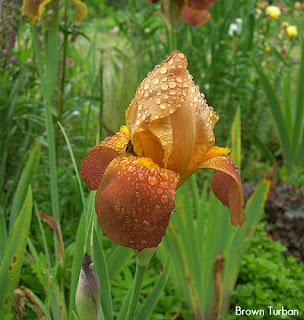 Rich, orange-gold falls rimmed and modestly veined in smoky maroon, 4 to 5 buds. Rebloomers tend to be among the first tall bearded irises to bloom in the spring, and they often color the garden for a week before the oncers begin blooming. In early April, 'Tara's Choice' and several other rebloomers were looking great. Unfortunately, I knew it was way too early for them to be safe in my Kentucky, zone 6, garden. As I finished my last AIS blog entry, the garden was hit by a heavy frost extending over three consecutive nights. Many of my seedlings were in full bloom and I'd begun making crosses for the 2012 year. They turned out to be busy work. The immediate concern was damage. What was damaged and how bad was it? It was bad. All stalks were cut down by the frosts. Most of the bloom was gone for the season, but a small number of irises put up new stalks. Some of the newer seedlings managed to open a bloom here and there. Although nothing could be evaluated due to damaged blooms, it was nice to see the colors. Who would have expected 'Born to Exceed' X 'Renown' (blue bi-tone and white) to produce a yellow seedling? I'd hoped to expand my photo collection, but unfortunately, I was not able to take many pictures. This blog will be handicapped or limited to existing photos until I have another good bloom season. There were no pods in the tall bearded section for 2012. About twenty crosses had been made when the frost hit and none survived. Another ten crosses were made post frost and none of these took. Recently germinated seedlings were frost bit but few were killed, fortunately. Since the spring bloom was three weeks early, so it should be no surprise that rebloom also started earlier this year. 'Pinkness' (Byers 89) tried to spring bloom, was damaged. and it was the first introduced iris to put up a new stalk, followed by 'Gate of Heaven' (Zurbrigg 2004) and 'Artistic Showoff' (Wilkerson 2011.) This is early for my garden, but there are reports of early rebloom in many parts of the US of A. Even before these three irises bloomed, two of my summer blooming seedlings gave a show. Both 2025-02Re and 2130-01Re have bloomed in July but started rebloom in June this year. Both have been used in breeding. I also have a couple of seedlings with stalks showing color. They won't open by June 25, but I'll give you a little peek at what I'll see in a few days! 2102-04Re has been a favored seedling since it was transplanted from the seedling pot back in the fall of 2007. At that point, I was impressed with its great root system, and I fully expected it to rebloom. My enthusiasm gradually diminished as I watched it set bloom stalks each spring, right after bloom season, and waited (impatiently) for signs of a fall stalk. Each year it sat and waited for spring to send up the stalks. In 2010 I moved a piece of it to the new beds. The clump opened three stalks post-frost season this spring. Last week I was thrilled when I finally spotted a rebloom stalk. I was shocked because I'd given up. More about this one in a later blog. It has great breeding potential. 1907-10Re bloomed all summer in 2011, had spring stalks, and it has another stalk ready to show color now. This shows potential for a good 2012 rebloom season. I hope to have a lot to report in August. At least I can dream. Much of the country had an early bloom season in the spring. Did any of your irises get hit by frost? 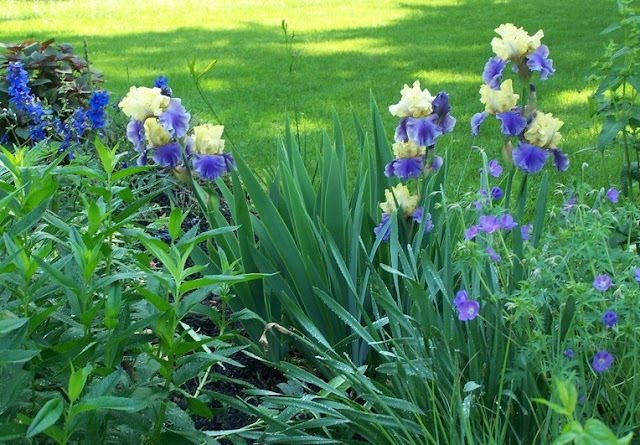 Have any of your reblooming irises sent up new stalks already this summer? Willis J. Fryer was a Minnesota farmer and nurseryman who hybridized and introduced irises in the early 20th century. While he introduced a great number of varieties only a small handful survive to amuse us today. Thankfully, one of the most important varieties in the history of iris breeding happens to be among them: 'W.J. Fryer'. A jaunty diploid variegata with rich golden standards over deep plush red-violet falls trimmed in gold, it was introduced in 1917 and was very well regarded. 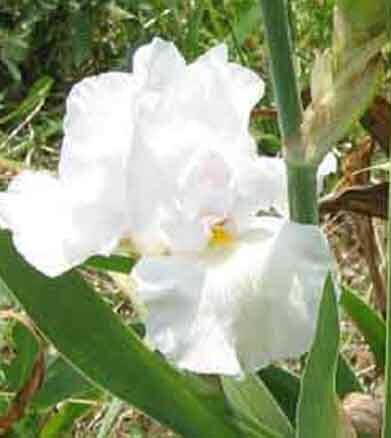 It is tall at 34" but sports small sized blooms, and is very hardy and reliable of bloom. "S. bright glistening yellow, slightly ruffled; F. reddish purple with narrow yellow border, white at the haft, beautifully reticulated old gold." The branching is excellent, and it carries its flowers beautifully, often with several open at once. Dr. Loomis daubed pollen from 'Ricardi', a tetraploid, on 'W.J. 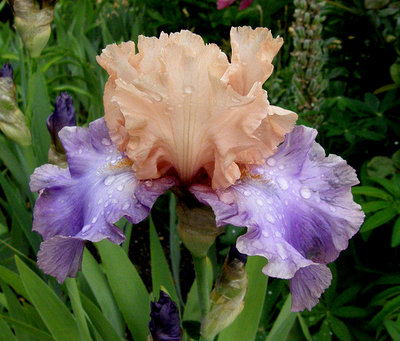 Fryer' in his Colorado garden and created the resulting seedling known as F70, which went on to produce 'Sea Shell', the first true pink iris Many more pinks followed and Dr. Loomis astonished and delighted the gardening world when he exhibited his pink irises at the 1933-34 Worlds Fair in Chicago. It was these varieties our modern pinks are all derived from, and it was all possible because of a little diploid variegata. This one of my favorite varieties and is always welcomed when bloom season arrives. 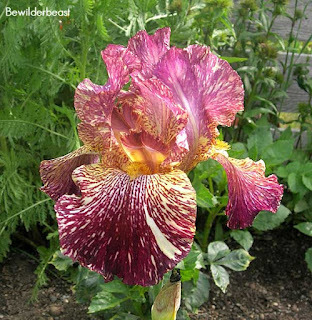 If you enjoy the old diploids add this classic old iris to your garden. You'll thank me later. 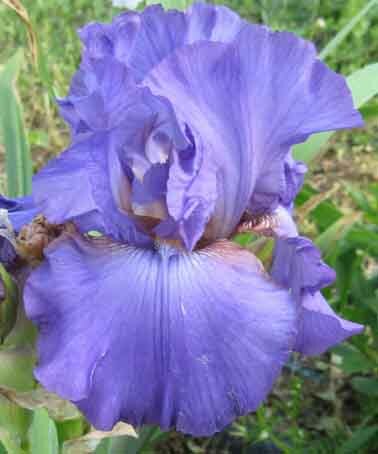 Since my retirement, I have scaled back the number of irises I grow, and I find that I enjoy each one more now. I now have time to really evaluate the varieties that I think are lovely. I also had time to visit a number of iris gardens this year, including Sutton's, Superstition, the Probst-Trio garden, Fred Kerr's garden, and Napa Country Iris. Finally, I went to the American Iris Society's spring Region 14 Meeting at Aptos. 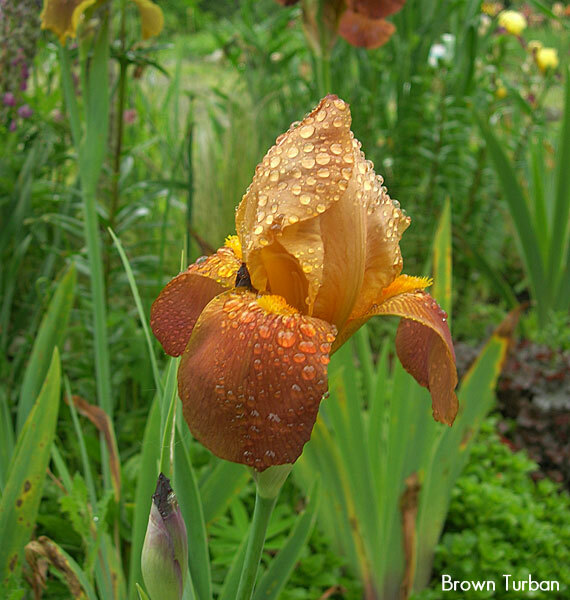 I took photos of some of my favorite irises in these gardens this spring, and here they are. 'Adriatic Waves' (Keppel '09). While some of the recent Keppel introductions don't seem to really like me a lot and seem to pout rather than grow, this one grows well and produces a fine stem. I really like the wide, blocky form. 'Broadband' (Tasco '02). This one is really growing on me--not as flashy for color as some of Rick's other introductions, but it does have very nice, wide form. Another interesting thing about the variety is that it can produce good and wide warm-toned plicata seedlings when crossed to brownish plicatas. 'Engagement Ring' (Ghio '11). This was very popular at the Spring Regional/TBIS meeting with its lovely color pattern. It's new, so still a bit expensive for me to add it to my collection now that I have tightened my belt in retirement. 'Genealogy' (T. Johnson '08). 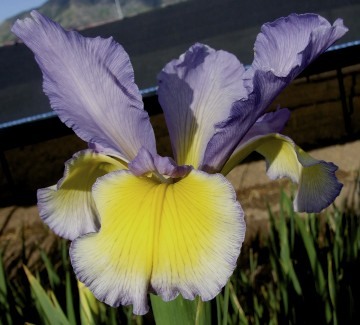 The parentage indicates this is from a yellow amoena (an amoena is an iris with white standards on top) and a blue neglecta (neglectas are blue irises with lighter tops, see 'Jerico Springs' below). The result is quite pleasing. Sort of a better approach to a brown-toned bitone, a color range rare in many iris gardens today. 'Jerico Springs' (Nicodemus '10). This is not just another neglecta: the texture veining on the falls sets this one apart from the rest. 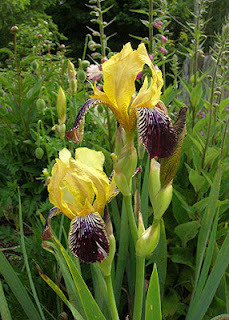 This is the iris I liked best this year of all the new things that I grew. 'Magical' (Ghio '08). Both last year and this year, I have been very impressed with this creamy pink that has wonderful branching and bud count. There is some talk, premature, of course, that this iris might be Dykes Medal quality. 'Mardi Gras Rose' (G. Sutton '12). If I were still buying introductions, this would have been on the must-have list. It is not a knock-you-dead color, but rather an elegant, soft lavender-rose affair. Great shape for the flowers and the stalks have wide branching and lots of buds. 'Spice Trader' (J. Painter '10). Browns seem to be out of fashion, but I really liked this in the early garden. (The odd blemish below the beard has to do with opening in 40 MPH winds.) It is very bright and colorful and it was not showing any frost damage in its home garden despite a late frost there, so it may be good for colder areas. 'Strawberry Frosting' (M. Sutton '10). This laced soft pink has impressed me two years in a row. Others have questioned whether the pale colors might fade out in warm areas, but I think it is lovely, as you can see here. Anyone who has read my previous posts knows that I am a huge fan of visiting other iris gardens. 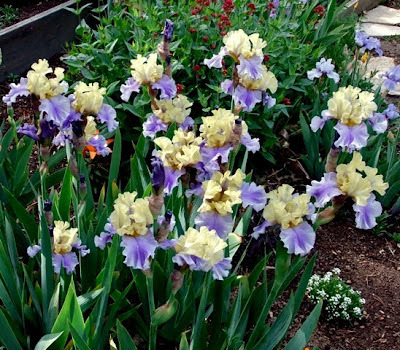 The wise gardener should try to get out and see what irises look like before buying. As always, this blog is just a snapshot, and I am sure had I had visited a week later, I would have found others that I liked at least as much. Did you visit any gardens this spring? Which irises caught your eye? Like probably most of you folks, I am busy in the garden this time of year enjoying the early summer. We're at peak bloom here in my Pacific Northwest garden and we're finally getting some warm temps in the 70's. Cooler weather these past few weeks have really extended the iris season quite a bit for us, and there's still more to come as the Japanese, Louisianas and foetidissimas are just about to start.This week I thought I would share some of the surprises that greeted me in the iris beds this year. The season got started when this cute little dwarf amoena bloomed. It doesn't have a name but is very similar to a white Caparne iris named 'Bride', so I've always suspected it might one of his. It sure made a nice bouquet, even with just a single flower on each bloom stalk. And it sure looked nice with the pink of the Lewisia and the pink dwarf geum and the bright chartreuse of Sedum 'Angelina'. Never prolific with the blooms it surprised me with 22 stalks this year! The always luscious and well named 'Death By Chocolate' (Bianco, 2001) never fails to delight with its dark, rich colors and velvet texture. Having just been transplanted last year to a new bed I was happy to see it blooming so soon. Next up, Keith Keppel's 1994 IB introduction, 'Protocol', was lighting up the garden just as the TBs were getting started. A welcome splash of bright, clean yellow and white that echoed the daffodils scattered about. This was one of the first modern IBs I'd grown and has long been a favorite. It was a bit of a surprise to see it as it had languished in very bad conditions for years before being rescued last fall.. Here's a cute little brown TB from 1942 by E.O. Essig of Berkeley, CA - 'Brown Turban'. This was its maiden bloom in my garden and I happened to see it for the first time as it was decorated with little rain drop jewels. Love at first sight! I had not expected it to be much and was pleasantly surprised to find it so charming. The wonderful old variety 'Elsinore' (C.H. Hall, 1925) delivered another stunning display on a fourth year clump. What color in the morning sunshine! This one was not a surprise - I knew it put on a good show. On a more modern note, Brad Kasperek's fabulous creation 'Bewilderbeast' (1994) showed it's lovely self off. A wild and fantastic pattern of splashes and stripes in wine, yellow and cream. Not the most vigorous grower here but worth every bit of garden space it needs. Then again, I've not had it in the best conditions so perhaps its spotty performance is my doing. Regardless, it is always a joy to see it. I've written of this one before. 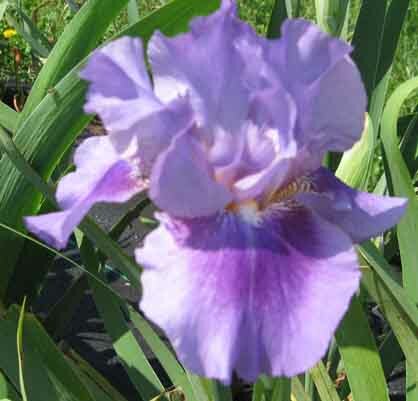 'Bayberry Candle' is simply one of the very best irises for consistency of performance and beauty. Every year it surprises me that it is yet again putting on a stellar performance with no care and no signs of struggle - and its planted in part shade too! 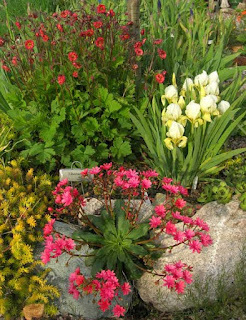 More varieties could use this ones vigor and robust habits. The color may not be for everyone, but you can't have it all. I'll leave you with this last shot featuring 'Nomohr' (Gibson, 1954), 'Chinquapin' (Gibson, 1959), 'Flashing Gem' (Gibson, 1956) in front of a volunteer foxglove all looking amazing together with a bright sky for a backdrop. This may have been my favorite accidental combo for the year. Foxgloves often surprise me with their serendipitous placement. I know it was a tough season for many folks in other areas. I hope you'll share with us some of the things that surprised you in your garden this year.What conditions did you face, and which irises did great regardless of the weird weather? Let us know. Post in the comments or add a photo to our Facebook page. And the next time you're in the PNW during bloom season stop by my garden and see the flowers. 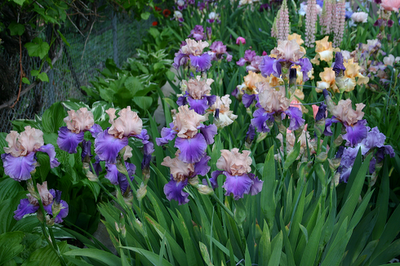 A beautiful iris garden in Monterey Bay that does not belong to the Weed of the Month Club! While dating myself since the various products of the month clubs seemed to have all disappeared, I used to joke in talks to groups that I belonged to the Weed of the Month Club. By that, I mean that weeds are opportunistic—get the tall ones under control and watch the short weeds move into that spot. Over the years, I have found 4 specific weeds to be the greatest problem here: morning glory, spurge, nut grass, and dock. Each have their specific problems and require different approaches to keep them under control. Morning glory (Calystegia ) arrived at this yard in mushroom compost that I had bought to build up the soil in the back of the yard. So often trying to solve one problem results in the arrival of a new issue. Roundup was suppose to be the cure all for morning glory, but like most panaceas it turned out to be less than was promised. Morning glory is amazingly vigorous—its roots have been found 10 feet down into the ground in trenches and morning glory seed can germinate for more than 10 years. Once in the garden, eradication is not really going to happen, so the focus has to be on keeping it under control. I have learned to never let morning glory flower since that only exacerbates the problem. Having reduced the morning glory infestation to sprigs here and there, I use a small quart spray bottle with Roundup and that does work. Spurge (Euphorbia maculata) is another weed that is not only a total pest, but requires immediate attention. After letting it get out of hand for a couple of years, I have found that the best solution is to nip it at ground level when it just has a few leaves. My tool of choice is an O-ring hoe; the sharp 0-ring is perfect for spot weeding. Unfortunately the manufacture seems to be out of business and I keep having to replace the handle, but that is a small price to pay for spurge control. Last year I thought I really had spurge on the run. One day I was cleaning the walk when I noticed what seemed to be spurge, but not the normal all green clone that I usually find. Yip, my spurge now has a brown and green clone that is hard to spot—once again the high hopes of eradication have been dashed. Nut grass (Cyperus rotundus) arrived in the yard by hiding in the roots of iris rhizomes that had not been properly and thoroughly cleaned. There was a time that I despaired that the nut grass was beyond control, but then I found Manage (no longer made, but I continue to use it up since one ounce was only slightly less expensive than a ounce of gold). At first I had to use the Solo backpack sprayer over large areas and Manage does work, though slowly. It translocates slowly to the roots and the nuts, so the kill is gradual over 3-4 weeks. Years into the battle, I am now down to hitting nut grass with the small spray bottle, but total eradication is most likely a phantom. Dock (Rumex crispus ) was in the yard when I moved here and in recent reading, I learned that the young leaves are eatable, though I am not sure why anyone would want to eat it. The county agriculture inspector told me that the solution was hoeing them off at the ground or Roundup. With its long, branched taproot, hoeing only seems to encourage more growth and Roundup seems to be the best solution if applied with great care. I've had to use the Solo backpack on large areas, but now I am back to the spray bottle since I can drip Roundup on dock leaves around irises without spray on the iris leaves. With all chemicals, correct application is vital. Roundup will “tulip” iris flowers, so any time that I use it over a large area, I wash off any nearby iris foliage when I am done; Roundup damage does not seem to be permanent, but the loss of good bloom for one year can be hard to take—I did a major round of cursing the neighbors a few years back when 40% of the iris bloomed with Roundup damage to to their gardener using it for everything and anything. 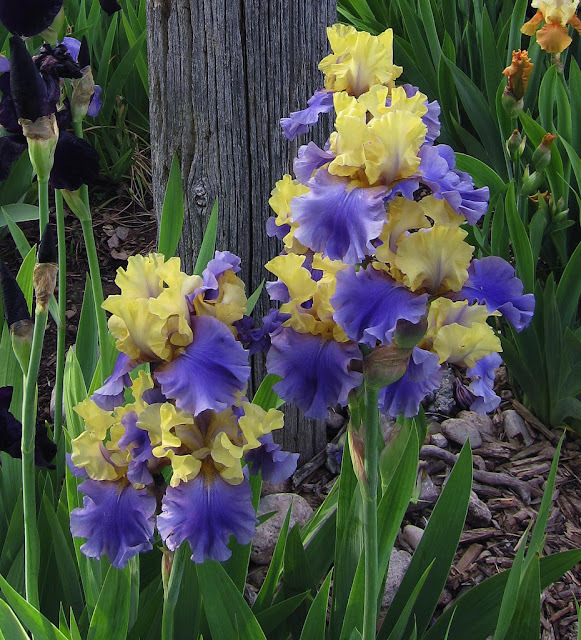 When using Manage, Manage splash seems to interrupt the correct expression of color in irises and daylilies, but the effects wear off within a few months. No matter how hard we all try, the weeds will always be with us. It does not help, either, if you have neighbors who allow their weeds to grow unchecked—on the east of the lot, I fight the encroachment of Bermuda grass from that neighbor; on the west of the lot, the avid gardener has given up any effort to control weeds (or snails, but that is another story) and I have to watch for nut grass sprigs invading under the fence. Just as we have the pageant of color in the garden starting in the spring, we also have the pageant of weeds to entertain and disgust us. Late at night, after I kiss my dear husband goodnight, I sneak out of our bedroom, pad down the hall, and turn on the computer in my study. 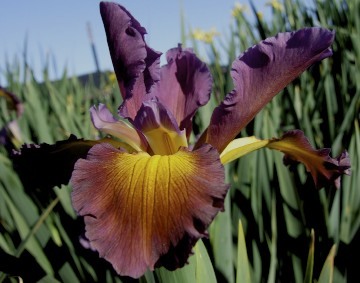 I spend hours on the internet chasing my next fix: beautiful photographs of irises. 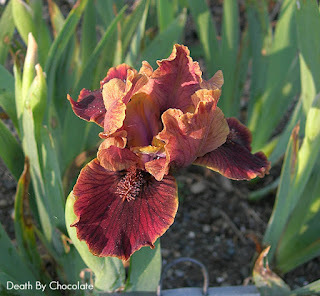 I search garden blogs, Facebook pages, garden forums, and commercial iris grower catalogs. I assemble dream gardens and wish lists. I expected to grow weary of this obsession within a few months and to move on, perhaps to something more respectable like playing Resident Evil 5. I was mistaken, and my nightly sojourns only leave me wanting more. Occasionally I find a photograph that is so beautiful that I must share. My husband Mike is a good sport, and will give an animated nod of appreciation when I call him in to look at an especially pretty iris, but to tell the truth, from the glazed appearance of his eyes, I suspect the Nairobi Trio is playing in his head. 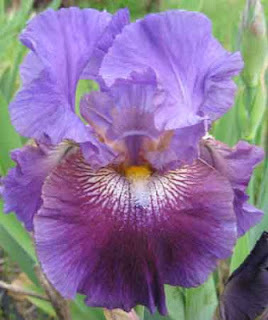 When I saw Barbara Kuhlman's photograph of Ben Hager's iris 'Edith Wolford' on Gardenweb, I knew I couldn't limit my sharing to Mikey. I had to share it with all of you. After a night spent with this photo, I recalled another lovely picture of 'Edith Wolford' and decided on the theme 'heavenly Hager irises.' I was smitten with this enchanting photo by Laurawege on Dave's Garden quite some time ago. Here the geraniums and delphiniums make perfect companions, and have me fantasizing about a new lavendar-blue and yellow bed in my garden. All of Joel Shaber's photographs of his Idaho garden are worth staying up into the wee hours to view, but his images of 'Edith Wolford' are particularly lovely. These photos show why this iris won the highest honor for an iris, the Dykes Medal, in 1993. The word 'clump' seems unsuited to describe such beauty. 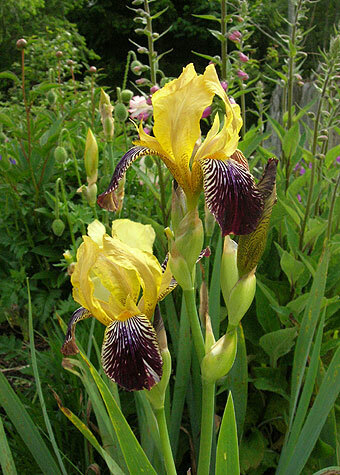 'Edith Wolford' blooms midseason and is a tall iris, reaching 40 inches. 'Poem of Ecstacy' was the winner of the John C. Wister Memorial Medal for tall bearded irises in 2004. Here it is paired with tall lupines in Susanne's garden, demonstrating her talent combining plants with different forms and coordinating colors. 'Poem of Ecstacy' grows to be about 36" tall and blooms midseason. 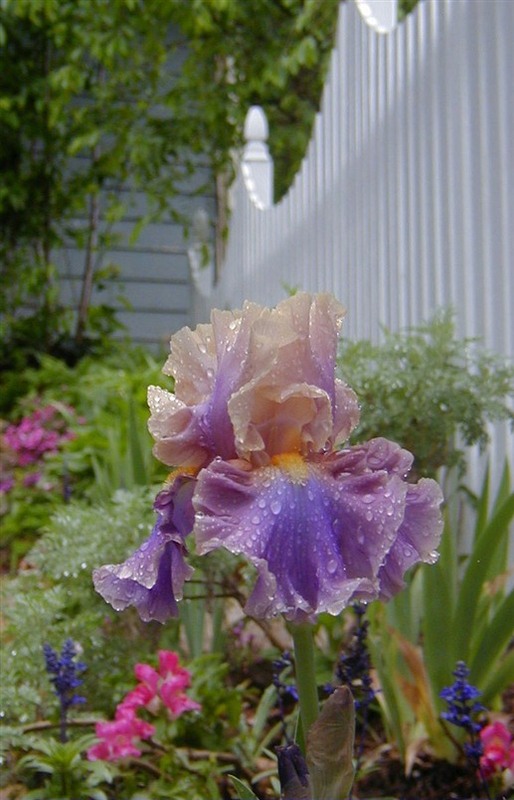 'Beverly Sills' is Ben Hager's most famous iris, with consistently high ratings in the American Iris Society's popularity polls. It was the 1985 winner of the Dykes Medal, and is named after the famous opera singer. It does her justice. 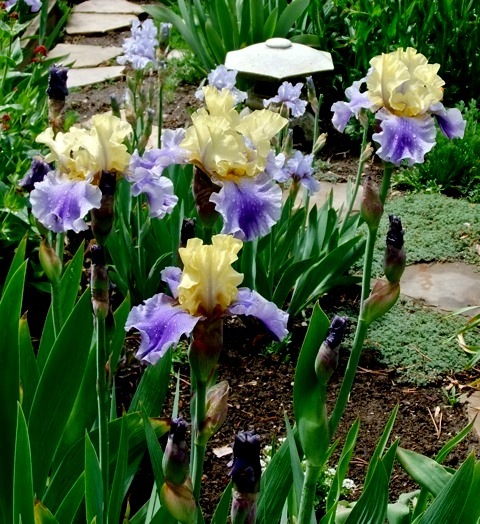 This iris is easy to grow in Southern California and makes a satisfying clump in a short period of time. It has quite an extended bloom season in cool weather here. Last year it was blooming from late April through June. 'Beverly Sills' is a pale, warm pink. 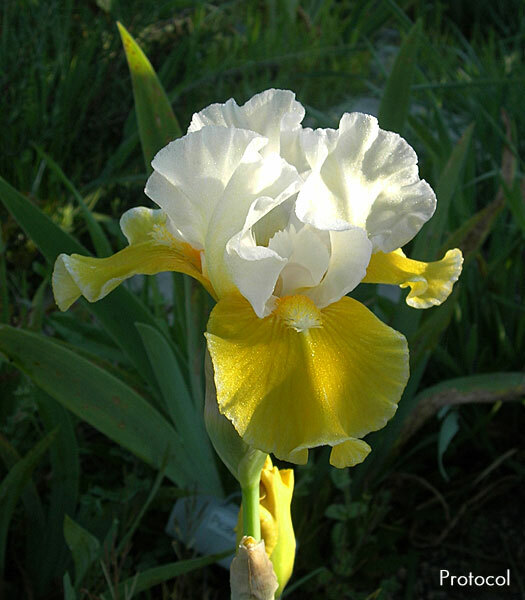 It is a photogenic iris, and has the wide falls that Ben Hager is so famous for creating. 'Chasing Rainbows' is a 1998 Hager introduction. Naomi DiVincenzo, an avid gardener who has just won her first blue ribbon for iris horticulture, grows a lovely clump on her grounds, Front Range Iris, in Colorado. You can see how she brought home the blue from this photo. This photo of 'Chasing Rainbows' by Becky Fain, the proprietor of the Inn at Iris Meadows in North Carolina, won first prize and appeared on the cover of the AIS magazine. 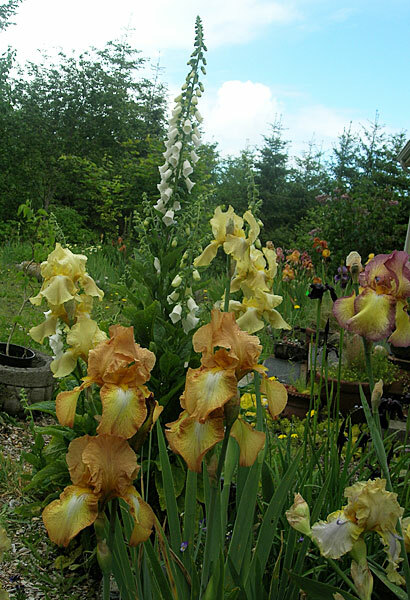 I wanted to make sure that those of you new to growing irises got to see it too. 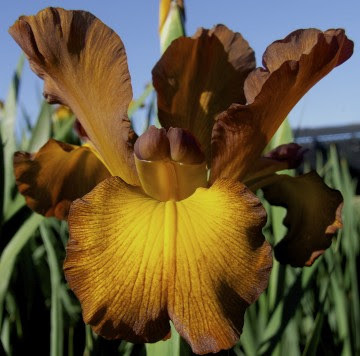 The American Iris Society Photography Contest is a wonderful way to share your irises, your garden, and your photography with other iris lovers. The deadline this year is June 30, so if you love taking pictures of your irises, please consider entering. We have many long nights ahead in front of the computer, and we need more beautiful photos!